Friday November 26th 1909 I had a letter from Hattie and she said Will is not well and she thinks I will be better satisfied to come home. I went to the train on the Altan at 2 oclock to bid Martie and the boys good-bye as they start to their new home in Stone Co. Mo. I then went over to [Venies?] to get my things ready and started at 4.07 I fell in with Ott and the boys at Rock Island. Hattie was waiting up for me when I got home at 12.15. Will is better but Rob & Cora had gone up there for the night. Saturday November 27th 1909 The children came home at 7.15 and at 8.30 I came home. I found Will much better. I got our dinners and went down town a little while to have Dr Smith treat my throat. Mary & Jennie were here awhile warm as summer Sunday November 28th 1909 It rained and as I have trouble with my throat did not go out any I got the meals put my things away and talked with Will. I wrote and read some. I felt I needed the day for rest. 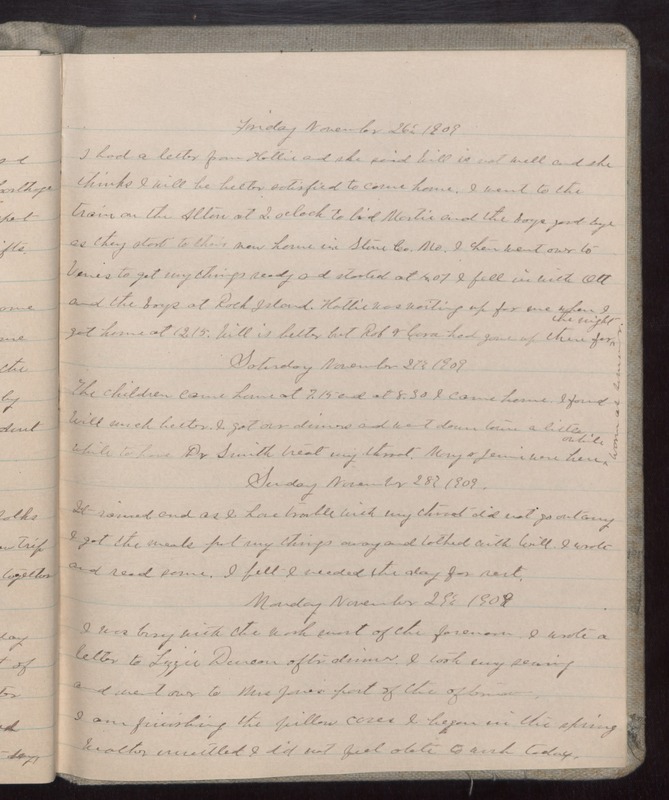 Monday November 29th 1909 I was busy with the wash most of the forenoon. I wrote a letter to Lizzie Duncan after dinner. I took my sewing and went over to Mrs Jones part of the afternoon. I am finishing the pillow cases I began in the spring weather [unmelted?] I did not feel able to wash today.